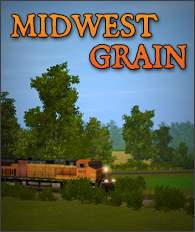 Midwest Grain is a fictional shortline railroad based in the Midwestern United States. The route features 2 large online grain elevators, a medium sized yard, an ethanol plant as well as other industries. This route will be a constant work in progress, so look for future updates and expansions in the very near future! Be sure to check out our content expansion pack specifically designed for this freeware route. This route is just perfect for me! I love switching industries and this route is just what I needed. You have a different industries that allows you a good mix of freight cars including boxcars, tank cars and grain cars and others if you so wish. And if there is not enough challenge for you, you can also throw in a passenger train to spice things up a bit!